Water-front condominium overlooking the Atlantic Ocean to the east and spectacular panoramic views of the Intracoastal Waterway. Developed on a 5-acre site with 246 luxury apartments in a 15-story building. Provided a new vision for the 70,000 sq. ft. pool deck located on the 6th level over 5 levels of parking garage. The design focused on taking full advantage of the grand scale of deck and the panoramic views it offers while providing a diverse program of amenities and activities. The material palette is a warm combination of wood and stone with accents of stainless steel and lush planting. Programmatically the deck is divided into 3 zones. These zones, however, are fluid and composed of inter-connected outdoor spaces. Spaces that are used for sport activities, lounging, dining, socializing and entertaining. The first zone is the fountain court featuring a wall fountain with a see-through fireplace. This area is closely associated with the clubhouse, providing a breakout space, summer kitchens and dining areas, a raised wood deck with ocean views and outdoor living room sitting arrangements. The second zone is the pool deck and cabana court with wide-sweeping views of the ocean and the Intracoastal Waterway. Replacing concrete walls with glass railing help in opening up the magnificent views. Introducing cabana courts on both side of the pool provided much needed shade around the pool deck. 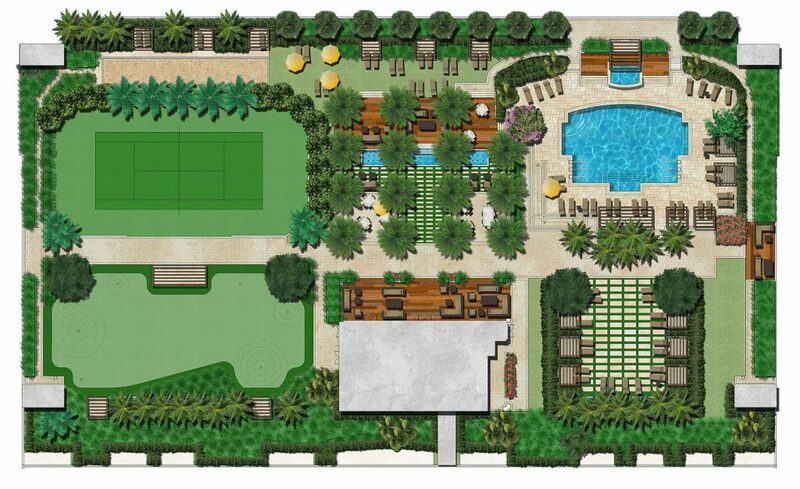 The third zone is the sport activities zone with putting green, tennis court and bocce ball court. The putting green composed of artificial turf is adjacent to the club room and can serve as a multi-purpose space for community events. The bocce court and the shade structure associated with it provide another space for social gathering and to enjoy the ocean breeze.